The funny thing about quality is everyone has a different opinion of what determines a “quality product”. Quality is kind of like beauty; where one’s opinion of beauty can greatly differ than the next person, so can opinions widely differ on quality. So therefore one can say: “Quality (like beauty) is in the eyes of the beholder”, or so it would seem anyways. Additionally, quality can often be sacrificed to make a delivery timeline or meet production deadlines, meaning quality can also be a moving target. This can make developing a QA/QC plan for a finishing process more art than science. In reality the final judge for product quality is the customer, as they are the arbitrator of what is important or acceptable about a product’s finish. A customer’s opinion about quality can be influenced by the value of the finish on a product, as well. For instance, if a product is functional in use, then the finish quality may not be very important. However, if a product is decorative in use or a functional product used in a decorative application, then the finish quality is extremely important. If you agree that your customer is the final approving authority on your product quality, this presents the next dilemma; “How do you identify what your customer is expecting for product finish quality?” The simple answer is: just ask them. This has become especially easy in our “connected world” where Facebook, internet questionnaires, customer feedback forums, etc. abound. Of course, you need to carefully craft the information gathering questions, or you may end up getting poor data that is unusable. For instance, everyone wants their purchased products to be the made from the best materials and craftsmanship possible, but they are rarely willing to pay a premium for these high standards. So it really comes down to; “What finish quality is the customer willing to pay for?”. Often the information received from customers is expressed in terms that are not directly translated into product design or quality attributes, or at least none that can be used directly to formulate a QA/QC plan. Customers may talk about the finish on their product being smooth and easy to clean, scratch resistant, not rust quickly, be long-lasting, not get dull, and use many other subjective descriptors. These customer driven descriptors need to be “translated” into actual product design and finishing performance requirements that are incorporated into the product design documents, such as product drawings and specifications. These design documents are then used in the selection of raw materials, pretreatments, coatings, and workmanship standards necessary to meet these customer driven goals. What you should end up with at this point is a complete list of quality standards that need to be verified to ensure that customer driven requirements are met, including smoothness, chemical resistance, surface hardness, corrosion resistance, UV resistance, gloss retention, etc. Add to these customer driven requirements form and fit requirements defined by the product’s assembly and end-use and you have the makings of a detailed and appropriate QA/QC plan. In addition to customer driven issues, there are numerous process control concerns that need to be verified to ensure the finishing process is in control and producing acceptable product. These may include film thickness, complete and consistent coverage, coating cure verification, dirt/contamination issues, coating adhesion, and many others. 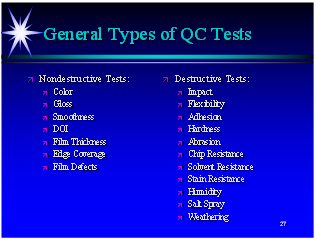 Incorporating these tests into a comprehensive QA/QC plan is extremely important, as well. The drivers for these process control issues may be ensuring that the product can be properly assembled, something that can be difficulty if the coating is too thick or easily chips because the cure or pretreatment were not performed properly. A product’s function can be adversely affected if the cure or pretreatment are inadequately executed in the process, as well. Other drivers for process control feedback can be driven by product cost. For instance, a thick coating will increase product costs, even if it can be assembled without difficulty. Dirt/contamination defects often indicate that equipment maintenance/clean-up is performed too infrequently, leading to higher rework and recoating costs. Of course, higher product finish quality standards require tighter process control. Tighter process control can only happen if finished products are checked for process-specific quality requirements at the conclusion of the process. By now you should have a pretty good idea what to verify on a product’s finish to meet customer, product design, and process control requirements. The next decision that needs to be made in your QA/QC plan is where to perform the testing, on the actual product or on test panels. Considering that some tests are destructive and can deface or destroy the finish or even the product, while others must be performed on teh actual product to have any meaning, this decision needs careful consideration. Anything on the destructive list needs to be performed on test panels or on areas of the actual part where the affected test area is hidden or covered by another component or label. 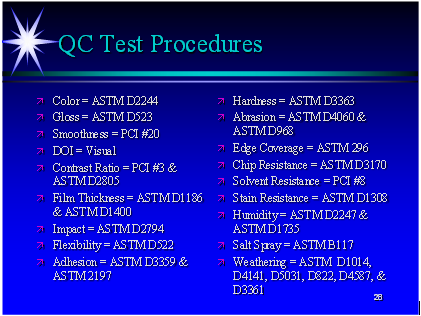 Some of these tests require the purchase of special, and often expensive, test equipment such as color verification, abrasion resistance, humidity resistance, salt spray resistance, and weathering resistance. However, other tests do not require much more than a few pencils (hardness), a film thickness gauge (film thickness), or q-tips and MEK solvent (solvent cure test). In addition to these “standard” tests, it may be necessary to perform “proprietary” tests. Proprietary testing often involves specific product finishing requirements that are unique to a particular product, such as chemical spot or immersion resistance. These proprietary tests may also involve visual or workmanship issues that are always product specific. For instance, one particular product may require extremely defect-free surfaces like jewelry, while other products can tolerate a few surface defects like automotive under-hood parts. In either case, define what is acceptable and what is objectionable, define the visual test conditions (i.e. lighting, inspection site distance, viewing angles, etc. ), and the number and size of the defects that are allowed per unit area (i.e. 3 defects ≤ 0.01 inches per square foot product area). Some testing frequency is determined by the customer, especially in build-to-print contracts, but others need to be tested at rates determined by the manufacturer/finisher. In these cases determine which tests are the most important for customer approval and critical to product function. These critically important issues should be inspected on 100% of the products. Less critical tests should be performed in a statistically meaningful manner, whereby you can be confident that the preponderance of the products leaving your facility meets expectations. In a “Six Sigma” system this means that only 1 product in 1,000,000 are judged defective (99.999999% acceptable product). Some finishing requirements are determined by coating formulation and may only need to be verified during incoming inspection of the material. Other finishing requirements, although formula related, can be degraded if the coating operation is improperly executed, such as color and gloss that can be degraded by improper curing. Finally, any process changes, such as line speed, gun settings, oven set-points, oven exhaust, etc., should be validated with testing. Once these process changes have been proven to be capable of achieving the desired goal, then you can back off on the process quality assurance testing. Generally speaking, defining a QA/QC plan is straightforward. Start with customer requirements, include product form and function requirements, and process control issues when making any QA/QC plan. Perform only those tests that are required to satisfy these identified requirements and avoid superfluous testing. Ensure that the testing is performed at intervals necessary to satisfy contractual requirements and statistical goals. Never allow QA/QC testing to be subjective to production or delivery demands; what is considered defective today must be defective tomorrow even if you really need to ship that defective part. Always maintain adequate QA/QC records to provide traceability in product recalls and report accurate defect rates to determine where process improvements are required.